Besides ham radio, I'm also an SWL, broadcast band DXer, and occasionally I'll try searching the utility bands for interesting signals. One day I found myself plagued by noise that was so intense, I thought I might have to give up the whole hobby. Everything from 150 KHz to 30 MHz was non-stop S30 noise! The noise was so intense that it was even up into the 2-meter band. A search found that one of the culprits was our family washer. It was a Sears/Kenmore unit, purchased in 2007. It had a circuit on it that would detect the moisture on the clothes being spun dry. When the noise would occur, (only when the unit was in operation), an alternator whine could be heard from 160 meters to 10 meters. It also would be in the AM broadcast band. I was in the process of designing a filter for it when the device broke a bearing on the drum, and it was easier to 86 the appliance than fix it. The new Whirlpool appliance is noise free. However, the power lines outside still plagued me. When it rained I would get interference up into the HF bands, and of course all of the AM broadcast band. When AEP terminated the employment of much of their workforce, one of the their lead guys in locating and fixing noise also was let go. I also had a barn light, purchased from Lowes, of Chinese manufacture. Thus there was ZERO support. The problem was traced to the light sensor on the top of the fixture. I bypassed it, and installed a Crouse-Hinds Industrial Products sensor, like I used on my tower at work. That fixed about 80% of the problem, but I still had issues with some noise from the fixture. After talking to a friend in Canada, who had similar problems, he referred me to these three docs. PowerConditioner.pdf: "Conditioner: An Audiophile Line Filter", Build this power line cleanser for your audio system. By Jim Hagerman. This filter is an easy DIY filter to make for your home studio or ham shack. SurgeXPowerGround.pdf: "Power and Grounding for Audio and Video Systems". A White Paper for the Real World - International Version. By Jim Brown, Audio Systems Group, Inc. A very good paper dealing with power distribution. TheOriginofBalancedPower.pdf: "The Origin of Balanced Power". By Martin Glasband. Reprinted from the September 1997 Issue of "Sound & Video Contractor" Magazine, with permission from Intertec Publishing Co. This is a good reference document for the explanation of balanced loads. First of all, read ALL the documents. 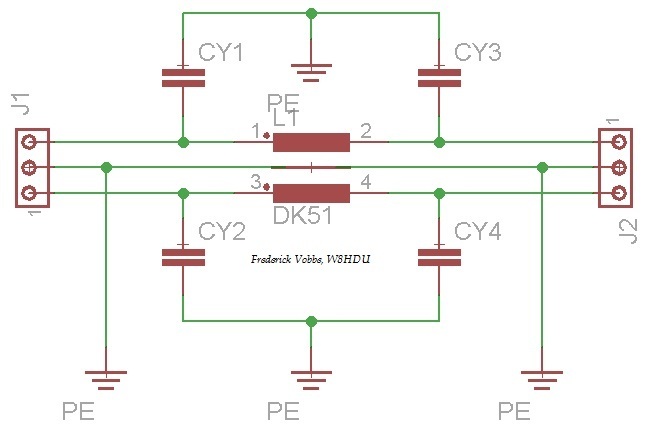 You'll get a better idea of how power distribution works, and how harmonics, and noise is introduced in power circuts. Second, unless you are in a brand spanking new grid, your power source will only be as good as the oldest equipment on the line. In my case, I looked no further than the 1960s transformers leaking oil, and decades old insulators cracked from years of neglect. My power company, American Electric Power, was of no help, and pretty much told me that they were too big and too powerful to lend assistance. It was up to me to fix the problem. This is the schematic for the filter I made. It consists of an EMI filter in the center, and (4) .01 mf 600 v "orange drop" capacitors. This was placed in series with the light, which completely solved that problem. I then made a higher amperage version for my ham shack. This helped the problem with the noise coming in. Subsequently, the insulator that caused most of the noise failed, causing a three hour outage, and emergency service by the power company. (Seemed to me that if they fixed it as a non-emergency it wouldn't have been as expensive, but AEP isn't the smartest company.